DALLAS – A new strategy for treating brain tumors may extend or save the lives of patients diagnosed with one of the deadliest forms of cancer, according to a study from UT Southwestern Medical Center. Imaging shows how a new treatment strategy gradually eliminated malignant brain tumors in mice. The images were taken every 10 days, with the tumor no longer visible after 20 days. UT Southwestern is working to fast-track the treatment for clinical use. 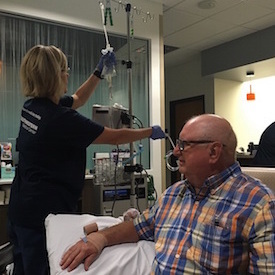 Dennis Kothmann prepares to receive his latest infusion of a medication designed to help his immune system fight brain cancer. The 71-year-old retired math teacher was diagnosed last fall with glioblastoma and opted to help test the experimental treatment rather than undergo chemotherapy.